The Grand Canal, a UNESCO World Heritage Site, is the longest canal in the world and a famous tourist destination. 1,776 km (1,104 mi) long and starting at Beijing, it passes through Tianjin and the provinces of Hebei, Shandong, Jiangsu and Zhejiang to the city of Hangzhou, linking five of China’s main river basins: Haihe River, Yellow River, Huaihe River, Yangtze River and Qiantang River. The oldest parts of the canal can date back to the 5th century BC, but the various sections were first connected during the Sui dynasty (581–618 AD). The Yuan (1206-1368 AD) and Ming (1368-1644 AD) dynasties significantly rebuilt the canal and altered its route to supply their capital Beijing. This led to a series of gigantic construction sites, creating the world’s largest and most extensive civil engineering project prior to the Industrial Revolution. It has played an important role in ensuring the country’s economic prosperity and stability and is still in use today as a major means of communication. In this itinerary, tourists can visit 17 major cities along this 1,776 km long Grand Canal by a private car and guide, to cruse some parts of the canal and enjoy many charming sceneries in these cities related to the canal. For sure it is a marvelous tour. The traditional Junction of the Grand Canal and the Qiantang River (the south end of the Grand Canal) - White Pagoda Park, and the current Junction of the Grand Canal and the Qiantang River, the Grand Canal Museum, the Gongchen Bridge on the Grand Canal, ancient streets along the Grand Canal, 9 Streams and 18 Gullies (Dragon Tea Plantation), Longjin (Dragon Well) Tea Village, the Soul Retreat Temple and Peak Flying from afar, Qinghefang Steet and Zhongshan Street, Huqingyu Tang (ancient Chinese herb pharmacy), the Bai Causeway, Lingering Snows on Broken Bridge (the bridge and pavilion at the east end of Bai Causeway), “The Autumn Moon on the Calm Lake” (a small lake side garden with a spacious platform, grand building, pavilions and bridges, here it is commonly regarded as the best place to enjoy the West Lake), Su Causeway, the Courtyard of Lotus Stirred by Breeze in Quyuan Garden, Boat to Three Pools Mirroring Moon (the biggest island in the West Lake). The Grand Canal and the West Lake are the UNESCO World Heritage. Tiger Hill, Xuanmiao Temple, Guanqian Street, Pingjiang Historical and Cultural Street Block, Suzhou Museum, Humble Administrators Garden (UNESCO World Heritage) and Chinese Classical Garden Museum, Cruising the Grand Canal, Master-of-Nets Garden (UNESCO World Heritage), Treasury Belt Bridge (UNESCO World Heritage) by the side of Grand Canal. Biji Lane, Cruising on the Grand Canal from the Crescent Islet in the Dongpo Park (ancient Yizhou Pavilion) which is in the memory of Mr. Su Dongpo (1037-1101 AD), one of the most prominent litterateurs in China. The Junction of the Grand Canal & the Yangtze River, the Jinshan Temple (Golden Hill Temple) & the No. 1 Spring in China, Ancient Xijing Ferry Area. Ancient Yicheng Post office, Ancient Zhenguo Temple in a islet in the Grand Canal, Gaoyou Lake which is also part of the Grand Canal. Xuzhou Museum, Han Dynasty Culture Area, includes the Museum of the Terra Cotta Warrior in Western Han Dynasty (202 BC–AD 8) and the Underground Palace of the Kings Mausoleum of Chu State in Western Han Dynasty. The Grand Canal Tourist Area, including the Dongdasi Mosque by the side the Grand Canal, Nan Wang Grand Canal Hub Archaeological Park (the highest place along the Grand Canal). Grand Canal Museum, Ancient Liaocheng city area in the middle of Dongchang Lake and Guangyue Tower, The Grand Canal Scenic Area including Shan Shan Guild Hall, Ancient Port on the Grand Canal, Ancient Iron Pagoda. The original water course of the Grand Canal (UNESCO World Heritage), Aotouji (means Sea Turtle Head Jetty) and Watching Canal Tower by the side of the Grand Canal, ancient Tax Office (UNESCO World Heritage). The North Terminal of the Grand Canal in Ming Dynasty & cruising on the Grand Canal, Hutong Area in Beijing, includes Shichahai Lake (the original Terminal of the Grand Canal in the downtown Beijing in Yuan Dynasty around 700 years ago.) and the site of the original Grand Canal course, Mr. Guo Shou-Jin’s Memorial Hall (Mr. Guo Shou-Jin designed the Beijing city and the Beijing-Tianjin Section of the Grand Canal in Yuan Dynasty, around 700 year ago), Qianmen Street, Tiananmen Square, the Forbidden City, the Great Wall at Badaling. * Cruising some parts in the Canal in Suzhou, Yangzhou, Gaoyou and Beijing. * Visit many attractions along the Grand Canal, include the south end of north end of the Canal, the junction of the canal and the Yangtze River. The first area you will visit in Hangzhou is the Grand Canal Museum, the Gongchen Bridge on the Grand Canal, ancient streets along the Grand Canal. and the current Junction of the Grand Canal and the Qiantang River. The next place you will enjoy is the 9 Streams and 18 Gullies and Longjin (Dragon Well) Tea Village. Nine Creeks and Eighteen Gullies area is a picturesque valley of tea plantation with high mountains, lush forests and wandering routes. A stream running across the path in the valley many times forms an enchanting scenery. The end of the path is the Longjing Tea Village with many tea houses. The walk at it not only brings you through the enchanted land of tea - it leads you scampering through a stream, 9 times over. And if you head out on a warm summer day, you may not want to leave. Along this picturesque valley, you can arrive at the Longjin Tea Village (The Dragon Tea Village) which is everything youd hope to find in search of an authentic Chinese tea drinking experience. Today, you will begin your tour with the visit to the Soul Retreat Temple and the Peak Flying from afar. Soul Retreat Temple was firstly founded in 328 AD and is a Buddhist temple of the Zen Sect located north-west of Hangzhou. It is one of the largest and wealthiest Buddhist temples in China. The Peak Flying from Afar which contains numerous Buddhist grottoes and religious rock carvings is in the front of the Temple. Afterwards, you will get to the West Lake to walk on the Bai Causeway, passing “Lingering Snows on Broken Bridge” (the bridge and pavilion at the east end of Bai Causeway), “The Autumn Moon on the Calm Lake” – the small lake side garden with a spacious platform, grand building, pavilions and bridges, here it is commonly regarded as the best place to enjoy the West Lake. Pass Su Causeway and stroll at the Courtyard of Lotus Stirred by Breeze in Quyuan Garden. You will take a boat near the Solitary Hill to get to the biggest island – Three Pools Mirroring Moon. As the day draws to an end, drive for around 160km/2h50m from Hangzhou to Suzhou. 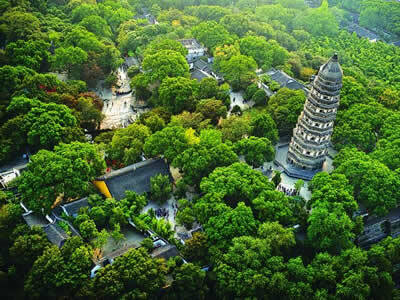 The first attraction you will visit in Suzhou is the Tiger Hill, the No.1 Sight of Suzhou and the Tiger Hill Pagoda on top of it has been the landmark of Suzhou for over 1000 years. You will find a number of historical sites, some of which can be traced back over 2500 years to the founding of Suzhou. Although the hill is relatively small it has rich history. The next place to visit is the very center of the ancient Suzhou city, Xuanmiao Temple (Temple of Mystery) with the main hall and three 17 m high gold-gilded clay statues of the trinity San Qing (three Pure Gods) built in 1179, and Guanqian Street, the east-west direction street which is right in front of the temple and the most famed and important business pedestrian street in Suzhou. Tourists can either take lunch in this area or in the nearby Pingjiang Street area. 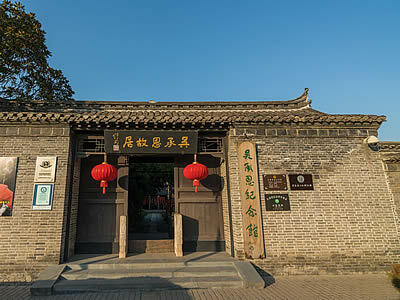 Pingjiang Historical and Cultural Street Block is located on both sides of the Pingjiang River in the eastern part of the ancient city and with an area of 30.66 hectares. 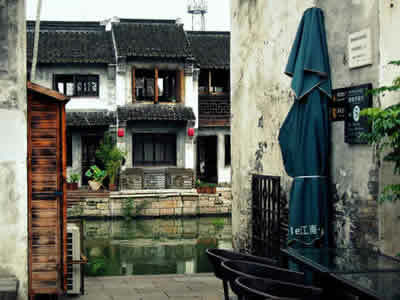 It is the most typical and the best preserved historical and cultural street block in Suzhou. The street pattern has come into being since 13th century. This street block is a typical section of the double chessboard pattern of the layout of the ancient city of Suzhou - with streets and waterways running parallel. The civilian residences along the streets, with black tiles and whitewashed walls, vary in height. Afterwards, tourists will visit Suzhou Museum, which has a vibrant collection of historical and cultural artifacts from Chinas ancient and as well as more modern past. The collection includes 30000 cultural relics - most notably for excavated artifacts, Ming and Qing Dynasty (1368-1911 AD) paintings and calligraphy, and ancient arts and crafts. The last and the highlight of this itinerary is the visit to the Humble Administrators Garden and Chinese Classical Garden Museum by the side of Suzhou Museum. Built in the early 16th century and developed over several centuries, the Humble Administrators Garden is the largest and most famous garden in Suzhou and its many styles are representative of the history of classical gardening in Suzhou. Originally designed by Mr. Wen Zhengming - the best painter in ancient Suzhou area and owned Mr.Wang Xianchen, a government official who either retired or was demoted before returning to his hometown. Water comprises three-fifths of the whole garden which is divided into three parts. The center one takes on its present appearance in the Later Qing dynasty though few original structure in Ming Dynasty (1368-1644 AD) remained. It features mountains and a lake at its center with many of the forty-eight buildings in the garden along its shore. Outstanding with the smart use of ponds, this elegant 5.6 hectare (13.8-acre) garden shows you how traditional Chinese architects and landscapers used pavilions, winding corridors, ponds, rockeries, and trees to create a relaxing harmony. In the early night, you will take the ship to Cruise on the Grand Canal in Suzhou to enjoy its charming night view. 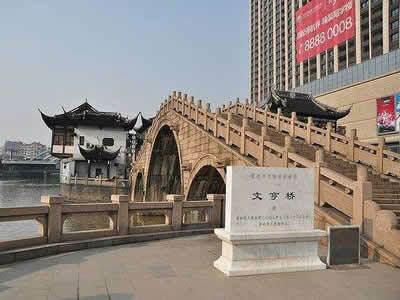 In the morning, tourists will visit the Treasury Belt Bridge by the side of the Grand Canal in Suzhou. Built between 816 and 819, 316.8 m long and with 53 apertures of bridge, this bridge is the longest ancient stone bridge in China. Afterwards, drive for around 45km/1 hour from Suzhou to Wuxi. Today in Wuxi, you will visit Xihui Park. In the Park, tourists will enjoy the 2nd Best Spring in China which is located on the slope of Huishan Hill and found around around 1400 years ago, visit Huishan Temple which was built around 1500 years ago, Taibo Temple which is for the prince Taibo who got to this area from central China around 3000 years ago and is the origin of the Wu culture - the main culture in the southern Yangtze River Delta, Jichang Garden (Pleasure Garden) which was buit around 500 years ago. Today in the morning, walking in the picturesque ancient Nanchang Street. 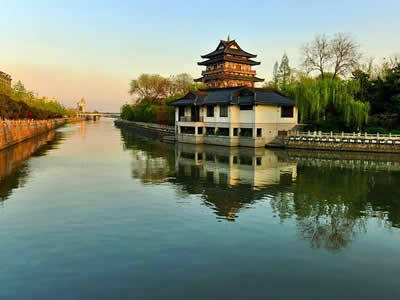 This area is located to the south of ancient Wuxi city area by the side of Beijing-Hangzhou Grand Canal. 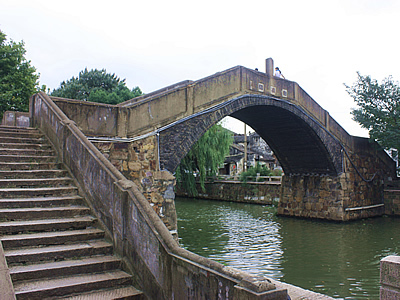 The ancient residential and commercial buildings of black tile and white brushed wall, flagstone streets and graceful bridges including the famous Qingming Bridge built in 1666 and spanning on the Grand Canal in this area are full of the representative features of water town in the South Yangtze River area. Drive for around 65km/1h15m from Wuxi to Changzhou City. In Changzhou, you will tour to the Biji Lane (Old Changzhou Street by the side of the Grand Canal), Cruising on the Grand Canal from the Crescent Islet in the Dongpo Park (ancient Yizhou Pavilion) by the side the Grand Canal. The Park was built to the memory of Su Dongpo (1037 -1101), one of the most prominent litterateurs in ancient China. Drive for around 140km/2hours from Changzhou to Zhenjiang city in the morning. 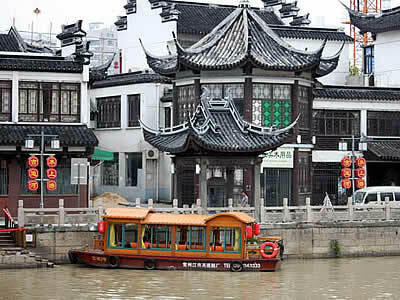 Today in Zhenjiang, you will visit the Junction of the Grand Canal and the Yangtze River, and the ancient Xijing Ferry - a well protected old corner in Zhenjiang which was the ferry for thousand years by the side of Yangtsze River and a Stone Pagoda built in Yuan Dynast (1206-1368 AD), the best-protected and oldest stone pagoda in China , stands across the street. The next place you will visit is the Jinshan Temple (Golden Hill Temple) and the No. 1 Spring in China. Built around 1600 years ago, Jinshan Temple is a famous and large Zen Sect temple with charming scenery, and located on a hill which was in the middle of Yangtze River, but now is at the inland because of the change of the Yangtze River course. Today in the morning, drive for around 40km/1.5 hour, cross the Yangtze River and get to Yangzhou City in the north of the Yangtze River. On they way, you will visit Ancient Guazhou Ferry, located by the side of the junction of the Grand Canal and the Yangtze River at the north bank, the most famous ferry in ancient Ferry in China. 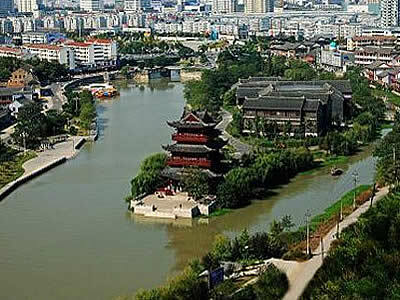 Before arriving in Yangzhou city, you will visit the Wenfeng Pagoda (outside) right by the side of the Grand Canal. This pagoda is also the landmark of Yangzhou city section of the Grand Canal for its graceful and straight figure. After arriving in Yangzhou city, before checking your hotel, you will visit the Tang Dynasty City Site Museum. During the Tang Dynasty (618-907 AD), with around 20 kilometers perimeter, Yangzhou is one of the 3 biggest cities and also one of the most prosperous city in China at that time. This museum is located at the old inner city area on a hill to the north of the current Yangzhou city. Today in Yangzhou, you will visit 1122 m long ancient Dongguan Street and the best protected ancient Yangzhou area around it. 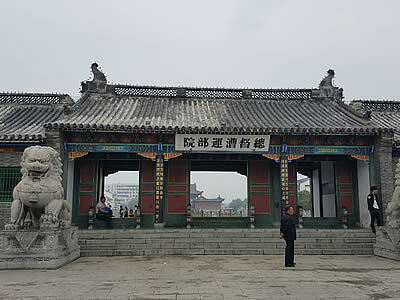 The east end of it is the ancient East City Gate of ancient Yangzhou city and the ancient Dongguan Port by the side of the Grand Canal, the oldest and the longest canal in the world. The famous Geyuan Garden is also on this street. Afterwards you will visit Slender West Lake, Pingshantang Hall & Daming Temple. Cruising on the Grand Canal in Yangzhou at night! 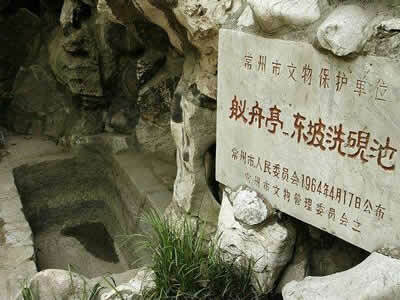 Today you will visit the Museum of Guangling Kings Tomb in Han Dynasty (around 2000 years ago) in Yangzhou at first. The mausoleum is for the king of Guangling State (who is the son of the emperor) and famous for its mysterious coffin – Huangchangticou – the typical royal burial regulation for coffin at that time. This set of Huangchangticou is the most complete one in China and very precious. Huangchang means the yellow tharm which implies the cypress wood with yellow core. Ticou means piece together the wood with their heads to the inside. So totally, it means to piece together the cypress woods to form a very thick wall to surround the coffin. The total tomb were built without any nails – only combined by the mortise-tenon connection. If we did not find the last piece, we could not detach it. So the building of it is very wonderful. Afterwards you will drive to Jiangdu City, around 20km/50m to the east of Yangzhou. Visit the Jiangdu Key Water Control Project, the most important water control project on the South-to-North Water Diversion Project in China. Then, drive for around 60 km / 1.5 hour to Gaoyou city along the Grand Canal. Today in Gaoyou, you will visit the the ancient Yicheng Post office, the biggest best protected ancient post office in China, Ancient Zhenguo Temple which is located in an islet in the Grand Canal, walkign by the side of Gaoyou Lake which is also part of the Grand Canal. Driving from Gaoyou to Huaian, 130 km / 2 hours, and Ovenight in Huai An city. Upon you arrive in Huai An city, visit the Ancient Huaian Governors Office, the biggest well-preserved ancient governor’s office in China. 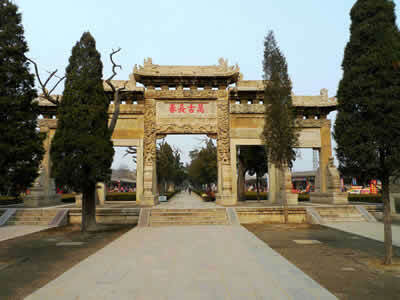 Today in Huai An City, you will visit the Inner Grand Canal Culture Corridor, a charming park by the side of the Grand Canal, ancient Hexia Town (including the old residence of Mr.Wu Cheng En, the author of the famous novel in ancient China - "Journey to the West" which described how a monkey king and his monk master to get to West Land to fetch the real Buddhist Bible. ) by the side of Inner Canal. Afterwards, drive for 190km/2.5 hours from Huaian to Xuzhou City. Today in Xuzhou, you will Visit Xuzhou Museum. and the Underground Palace of the Kings Mausoleum of Chu State in Western Han Dynasty. This Mausoleum is a super-huge mausoleum for the vassal king in Western Han Dynasty, one of the 100 great archaeological discoveries in China. Around 2000 pieces/sets precious relics were discovered at it, and most of them, including the biggest Jade Clothes Sewn with Gold Wire, were displayed in Xuzhou Museum. Drive for around 180 km/2.5 hours from Xuzhou to Qufu city in the morning. and get out of the north gate of Qufu city to the Confucius and His Familys Cemetery to visit the Tombs of Confucius and his son and grandson. All of them are the UNESCO World Heriate. Drive from Qufu to Jining city, 50km/1 hour, visit the Grand Canal Tourist Area, including the Dongdasi Mosque by the side the Grand Canal, which is one of the 5 biggest ancient Mosques in China, built around 600 years ago. Then drive north to visit the Nan Wang Grand Canal Hub Archaeological Park which is the highest place along the Grand Canal. In the museum here, tourists can know how to solve the problem of water levels at this water ridge area. It is really the miracle of the construction of the ancient water transportation project. Afterwards, drive norh to cross Yellow River, the 2nd longest river in China, to Liaocheng City, 180km/3 hours. Visit the Grand Canal Museum in Liaocheng city. Ancient Port on the Grand Canal, Ancient Iron Pagoda. As a rare large lake in the north area of the Yellow River, Dongchang Lake was as large as 6.6 km2, 3-5 m deep, and built in 1070. 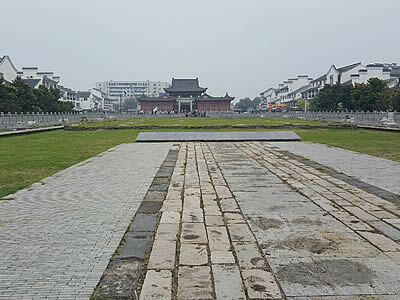 The 1 km x 1 km square ancient Liaocheng city is in the middle of the lake still keeps its original shape. The Guangyue Tower is in the middle of the city. Drive for around 75km/1.5 hour from Liaocheng to Linqing city. Tour in Linqing City to visit the original water course of the Grand Canal (UNESCO World Heritage) which is still in use, Aotouji (means Sea Turtle Head Jetty) and Watching Canal Tower by the side of the Grand Canal, the only ancient Tax Office (UNESCO World Heritage) which is still well preserved along the Grand Canal. Drive for 240km/3 hour from Linqing to Cangzhou city. Visit the Cangzhou Iron Lion which is 40 tons heavy and made in 953 AD, the most famous iron lion in China. Tianjin is one of the 4 Municipalities under the direct administration of the central government of China, along with Beijing, Shanghai and Chongqing. the Old Foreign Concession Area including St Josephs Cathedral Church. Today in Tongzhou area in Beijing, you will visit the North Terminal of the Grand Canal in Ming Dynasty (1368-1644 AD), now located in the Tongzhou District in the east of Beijing city, cruising on this section of the Grand Canal. The tour in Tongzhou will take around 3-4 hours. Then drive to downtown Beijing to check in another hotel in Beijing. In downtown Beijing, you will visit Hutong Area in Beijing (well-protected old Beijing Lane Area), includes Shichahai Lake (the original Terminal of the Grand Canal in the downtown Beijing in Yuan Dynasty around 700 years ago.) and the site of the original Grand Canal course, Mr. Guo Shou-Jin’s Memorial Hall (Mr. Guo Shou-Jin designed the Beijing city and the Beijing-Tianjin Section of the Grand Canal in Yuan Dynasty, around 700 year ago). Your tour in Beijing today will began with the strolling on Qianmen Street, an old Beijing style commercial street right to the south of Tiananmen Square. Afterwards you will walk north to visit Tiananmen Square, the heart of China and the biggest square in the world. Then walk through an underground tunnel to pass Chang An Road before the Tiananmen Rostrum to get into the Forbidden City Area, visit the Forbidden City (Palace Museum & Imperial Palace, UNESCO World Heritage) - the history and meanings of it will be unlocked by your guide. Glean the history out of a place where the guidebooks leave you short. It has served as the residence to 24 emperors throughout the Ming and Qing dynasties (1368 AD - 1911 AD), but is now used as the Palace Museum. The Forbidden City has been the center of the highest authority for more than 500 years in China. With garden landscapes and an enormous architectural complex consisting of 9,000 chambers and halls containing furniture and works of art, it has become the historical landmark witnessing invaluable Chinese civilization during the Ming and Qing dynasties. In the afternoon, you will drive for around for around 80 km/1.5-2 hours to the north of Beijing into the mountains to visit the Great Wall at Badaling (UNESCO World Heritage), walk and enjoy the fantastic view there. Your private guide and driver will meet you at your hotel according to your time leaving Beijing. Say goodbye to your guide and checking in your flight for your next destination.